Adrien Ravon is an architect operating across the boundaries of different disciplines by combining both theoretical and technical approach. Ravon completed his studies at FADU-UBA and ENSAPM, Paris, where he defended his Master’s thesis. In parallel to his academic path in architecture, Ravon has studied programming, multimedia and interactive games. After collaborating as an architect with Jakob+MacFarlane in Paris, Ravon joined The Why Factory in 2011 as a teacher and researcher. He has worked on various projects and had a key position in advancing the Future Models course, which provides specific computing support to The Why Factory’s work. He co-authored The Why Factory’s publication Barba, life in a fully adaptable environment and is now supervising The Why Factory’s graduation unit. 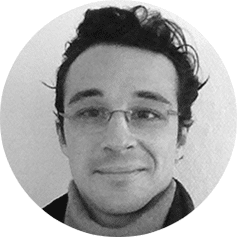 Adrien has worked with the Berlage Institute, Rotterdam; ETH Zürich; KTH Stockholm, EIT ICT Labs, and the IIT in Chicago.